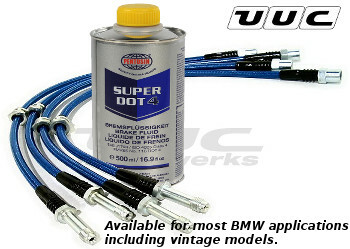 THE BEST BMW BRAKE DEALS ARE HERE AT UUC! 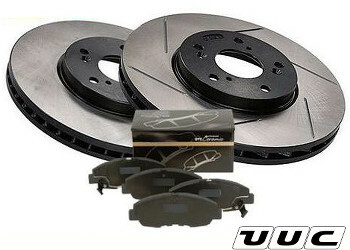 4-wheel replacement brake rotor and pad packages starting at $144. FREE DTC CERAMIC BRAKE PADS with every pair of OE-fitment brake rotors, $65 value. Brake pads automatically added to your order. Pads are low dust, quiet, and long-lasting. All rotors are black e-coated in unswept areas to eliminate unsightly rust. Compare our premium rotor prices against the best online prices! [ CLICK HERE ] for brake rotor fitments and pricing. Most other BMW applications available. Choose from plain or slotted surface. Optional stainless steel brake lines available at discounted pricing.